Blog Will 49-yo Mark now have the life expectancy of a 19-yo Mark? 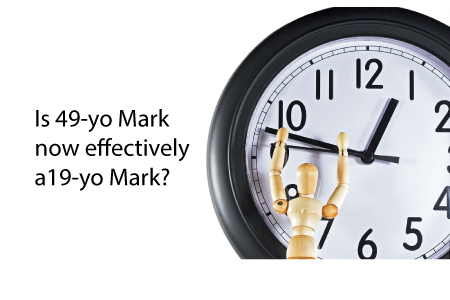 Will 49-yo Mark now have the life expectancy of a 19-yo Mark? I have an interesting anecdote to present but let me first say this is one case and that results may not be typical. There are a myriad of other factors that could contribute. But what would you do if you found out you had 30 more years of length on your telomeres? Mark came to me in 2013 and wanted to start TA-65. He took 4 capsules nightly and was feeling great. His baseline measurement of leukocyte telomeres was 6,400 base pairs with 20% critically-shortened ends (<3,000 base pairs means they are at risk for mutating). On the current version of testing, we could add 3,000-4,000 base pairs to the original result as a ‘fudge factor’ to give him a starting point of 9,400. After one year of TA-65 use, his median length had increased over two decades worth to 11,700 but more importantly, the percentage of critically-shortened ends had dropped from 20% to 7.5% (seen in red.) The histogram shows lengths between 3,000 and 5,000 in yellow. All available lengths are measured and show in a simple frequency distribution (e.g. 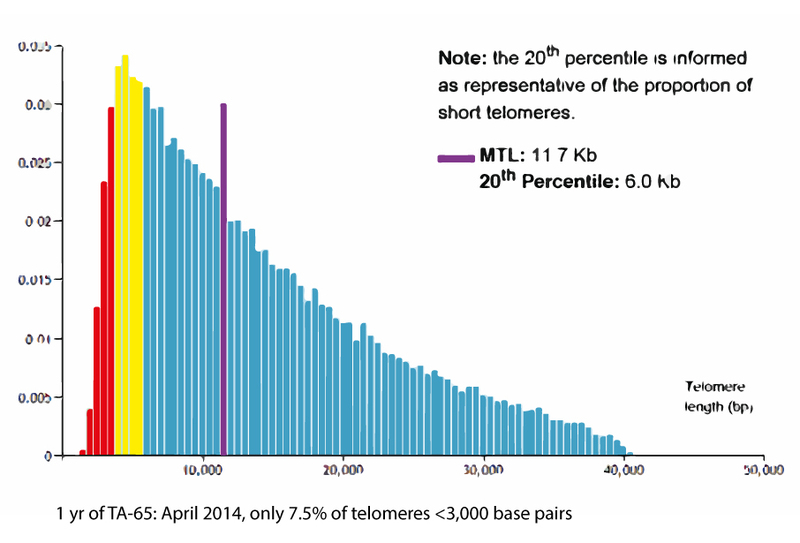 the right-most red bar is showing that 3% telomeres were between 2,500 and 2,999 base pairs). 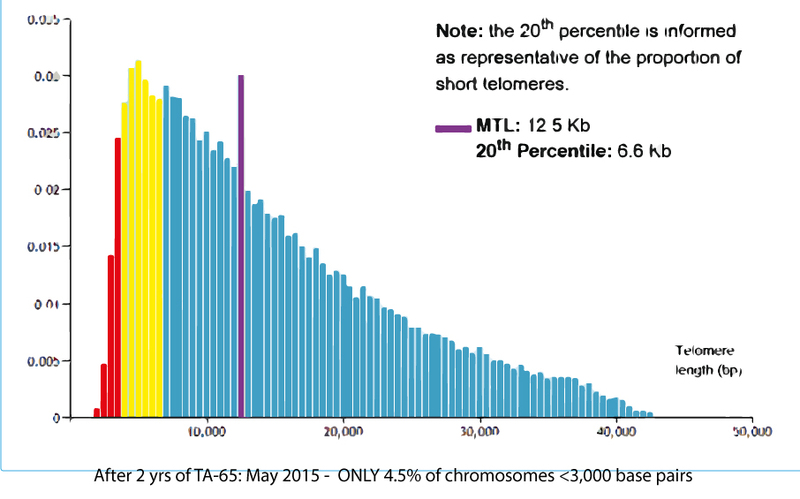 After two years of TA-65 use, his median length is now 12,500 (from an estimated 9,400) with a very nice drop in critically-short telomeres to 4.5% (from that high baseline of 20%). 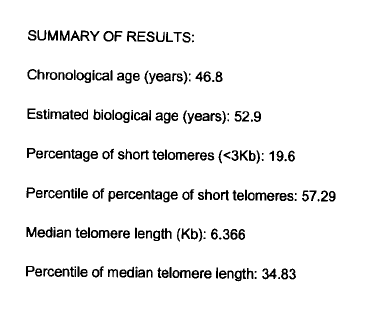 So if you believe what most research is showing regarding the connection between shorter telomeres and longevity, Mark may have gained over 30 years of longevity in a time where he should have lost three years. In the future, we may have a better understanding of whether taking TA-65 and these changes are related. I am merely presenting an interesting anecdote. 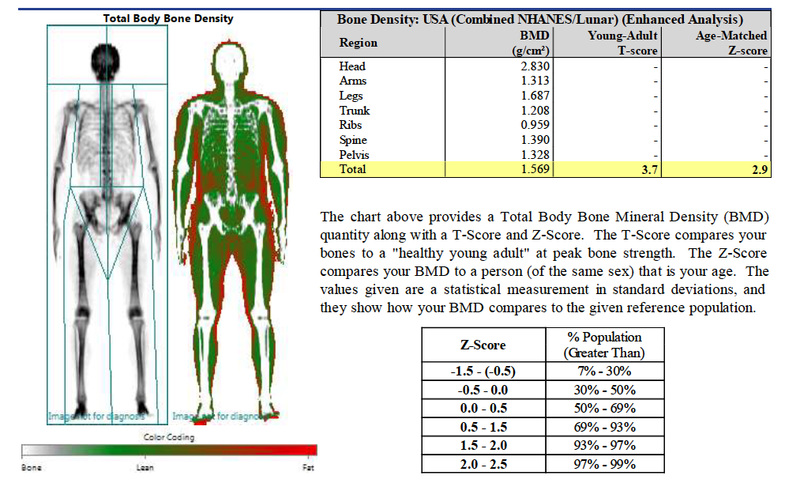 But despite the stress of losing his mother to brain cancer in the interim and an associated increase in his BMI as a result, his bone density remains in top 1% for men his age. Perhaps this is another change that could be related to adaptogenic benefits? For more information on measuring telomeres see this podcast or read this blog. For information on bone health and why taking drugs to prevent osteoporosis may be a bad idea, watch this podcast.